This week, we've been focusing some editorial power on drum corps memories from our Canadian friends and thoughts about drum corps north of the American border -- we are Drum Corps International, after all. Steve Kress, a percussion instructor with Edmonton, Alberta's Strutters, set a world record for the longest snare drum solo earlier this week. Steve Kress at the 16-hour mark. The 18-hour, 7-minute record is a first -- Guinness, the famed keepers of all world records, did not have a "longest snare drum solo" on record until Kress set it, Kress said. "It's a world record," Kress said, "I've sent in the paperwork." 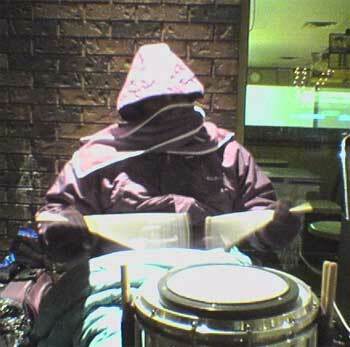 In addition to the natural fatigue that sets in after an 18-hour drum marathon, Kress battled the Canadian Mother Nature -- in "true Canadian fashion," Kress said, he elected to perform the solo outside in downtown Edmonton, where the temperatures plummeted to around 7 degrees Fahrenheit. "To stay warm, I had to stay in the same position – I couldn't get up and stretch because it was so cold!" Kress said. Kress said the weather finally cut short his solo. "I had to stop at 18 hours – I couldn't feel my left arm anymore," Kress said. The Guinness corporation says that due to the volume of record-setting attempts it receives, it may take up to six weeks for Kress' record to be "officially" acknowledged, acccording to its Web site. Kress set the record to increase the publicity of the Strutters. "I did it for our membership -- to get the buzz going about our drum corps. It's hard to get kids involved in the activity, so we decided to do something to drum up attention -- no pun intended," Kress said.